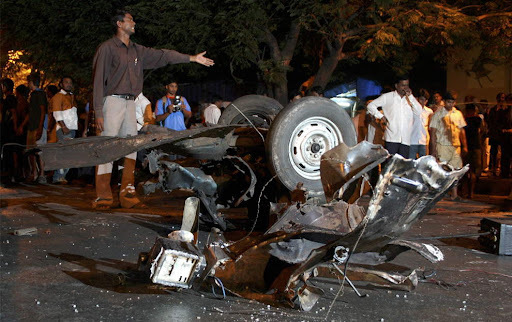 Late Wednesday night, Mumbai, India found itself the target of a ferocious terrorist attack, and the situation remains unresolved even now, three days later. 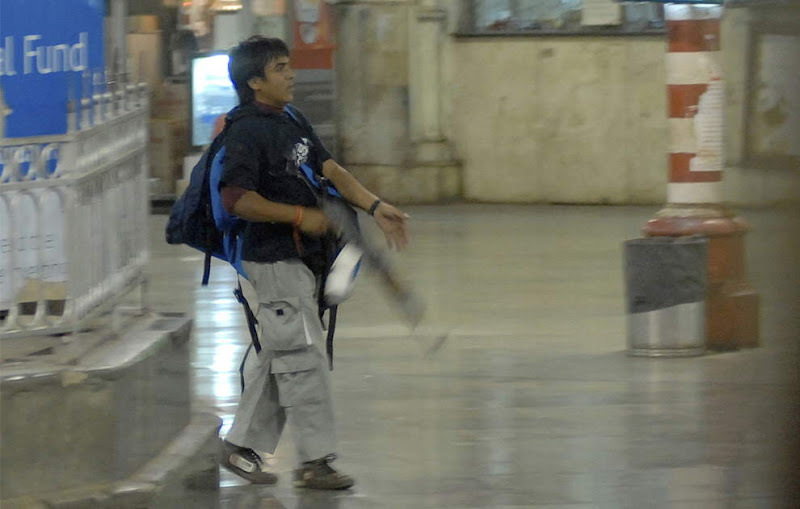 According to reports, upwards of 60 young men entered Mumbai in small inflatable boats on Wednesday night, carrying bags filled with weapons and ammunition, and spread out to nine locations to begin their attacks. 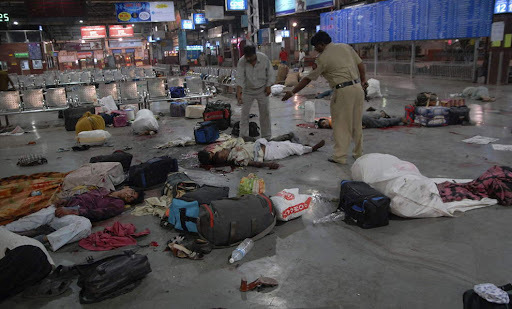 Lobbing grenades and firing their weapons, they entered hotels, a railway station and several other buildings, killing scores and wounding even more. 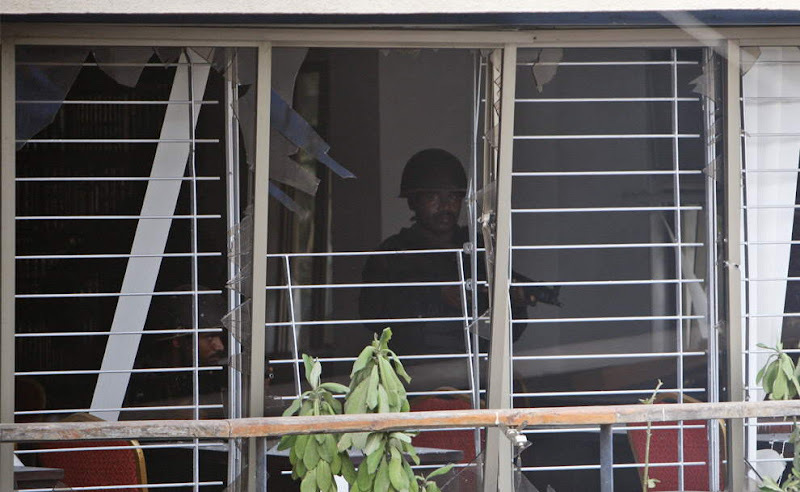 As of this moment, the identity of the attackers has yet to be definitively determined, though there are reports indicating some of the gunmen were Pakistani - at least nine of them have been killed, nine more arrested. 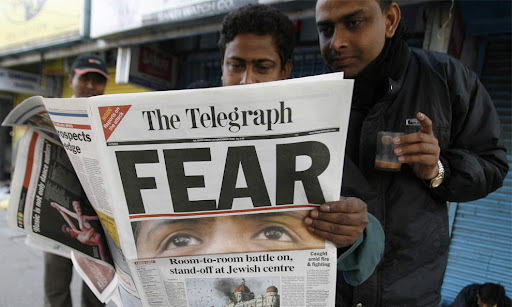 As of this writing, there were a reported more than 150 people killed from 11 different countries - though nearly 100 were Indian. 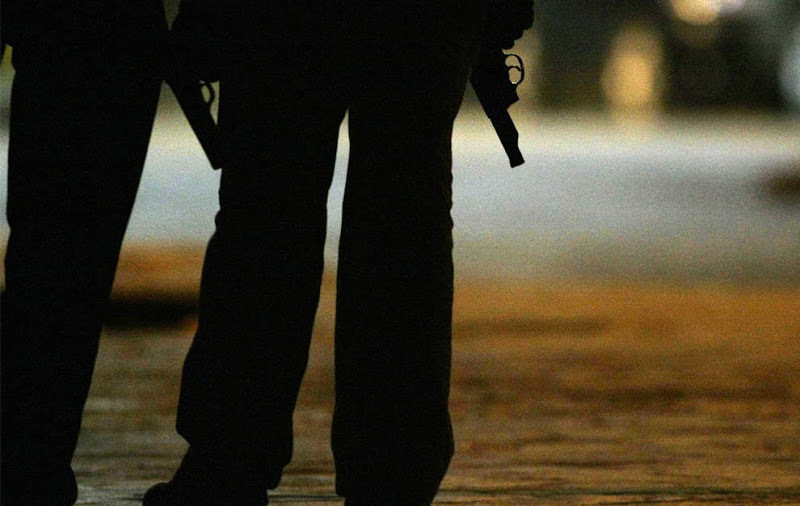 More than 300 injuries have also been reported - those numbers may yet rise as several hostage situations still exist in the city. 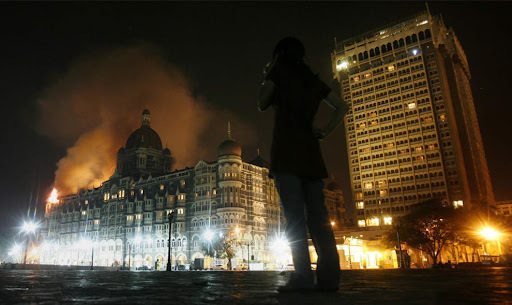 A reporter talks on her phone as smoke is seen coming from Taj Hotel in Mumbai November 27, 2008. Large plumes of smoke were seen rising from the top of the landmark Taj Hotel in Mumbai on Thursday and heavy firing could be heard, a Reuters witness said. Injured Indian security personnel lie at the Chatrapathi Sivaji Terminal railway station in Mumbai, India, Wednesday, Nov. 26, 2008. 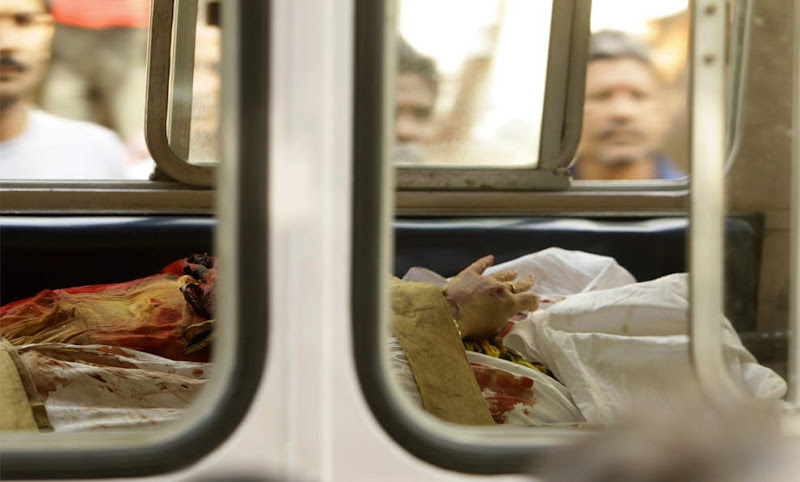 The two men later died from their wounds. 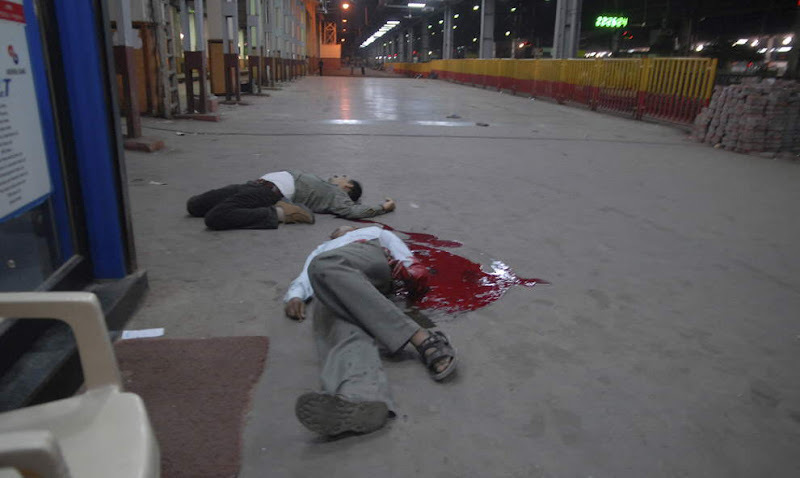 Armed gunmen are seen in the Chatrapathi Sivaji Terminal railway station in Mumbai, India, Wednesday, Nov. 26, 2008. Teams of gunmen stormed luxury hotels, a popular restaurant, hospitals and a crowded train station in coordinated attacks across India's financial capital, killing people, taking Westerners hostage and leaving parts of the city under siege Thursday, police said. 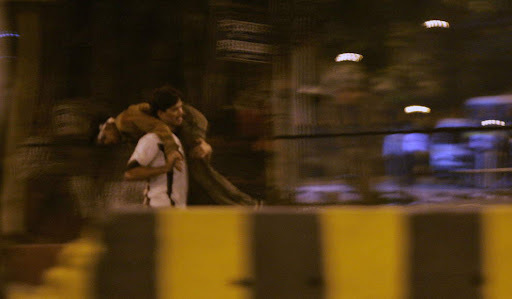 A man carries a victim of a gun attack away from the scene of an earlier attack at the Chatrapati Shivaji Terminus in Mumbai, India, Wednesday, Nov. 26, 2008. 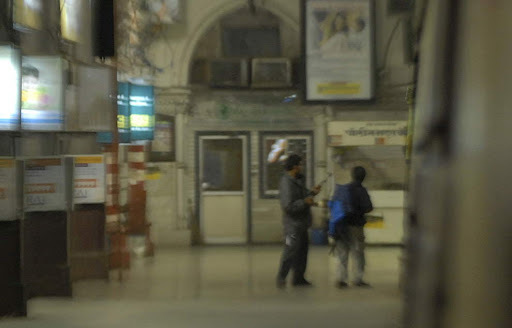 A gunman walks through the Chatrapathi Sivaji Terminal railway station in Mumbai, India, Wednesday, Nov. 26, 2008. 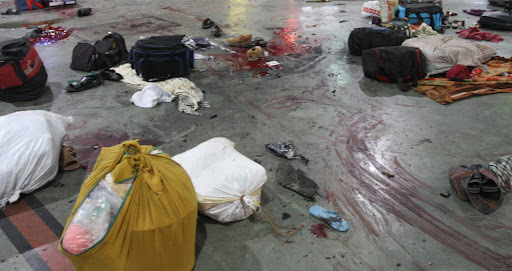 People's belongings are seen lying on the floor amongst streaked pools of blood at the shooting site in Chattrapati Shivaji Railway terminus in Mumbai on November 26, 2008. The bodies of at least six victims of Wednesday's shootings lie on the floor of the Chattrapati Shivaji Terminus railway station in Mumbai November 26, 2008. Onlookers stand at the site of a bomb blast in Mumbai November 26, 2008. 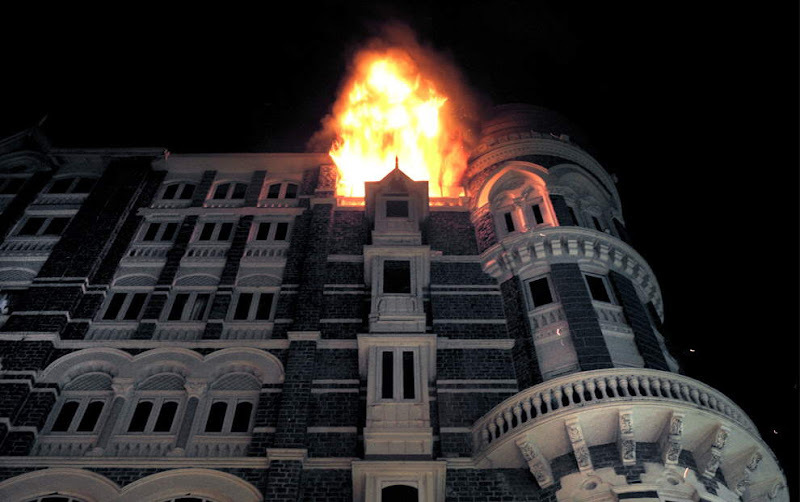 Fire engulfs the top floor of the Taj Mahal hotel, site of one of the shootouts with terrorists in Mumbai on late November 26, 2008. 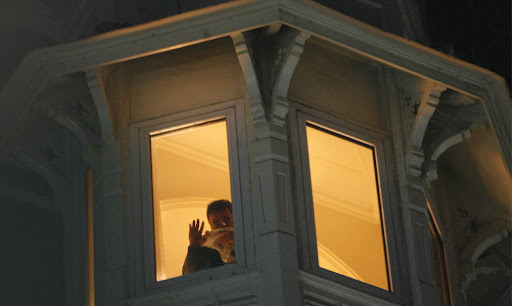 An unidentified guest of the Taj Hotel watches other guests being rescued from a window of the hotel in Mumbai, India, Thursday, Nov. 27, 2008. 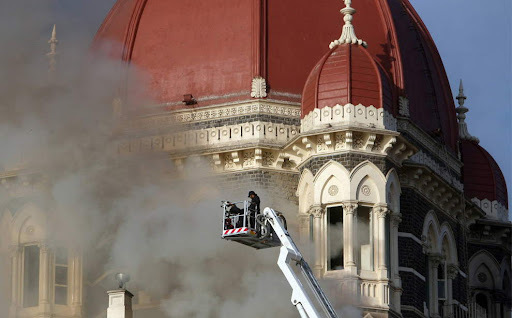 Employees and guests of the Taj Mahal hotel, site of one of the shootouts with terrorists, are recued by firefighters as fire engulfs the top floor on late November 26, 2008. The body of a terrorist attack victim is brought in an ambulance to the St. Georges Hospital in Mumbai, India, Thursday, Nov. 27, 2008. Dozens of people were still trapped or held captive Thursday. 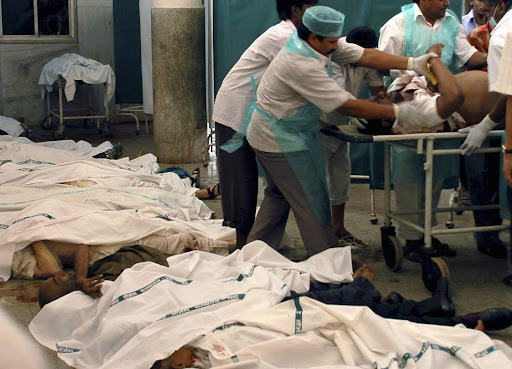 Hospital attendants place the body of a victim of Wednesday's shootings on a stretcher at the St. George hospital in Mumbai November 27, 2008. Firefighters try to douse a fire at the Taj Mahal Hotel in Mumbai November 27, 2008. 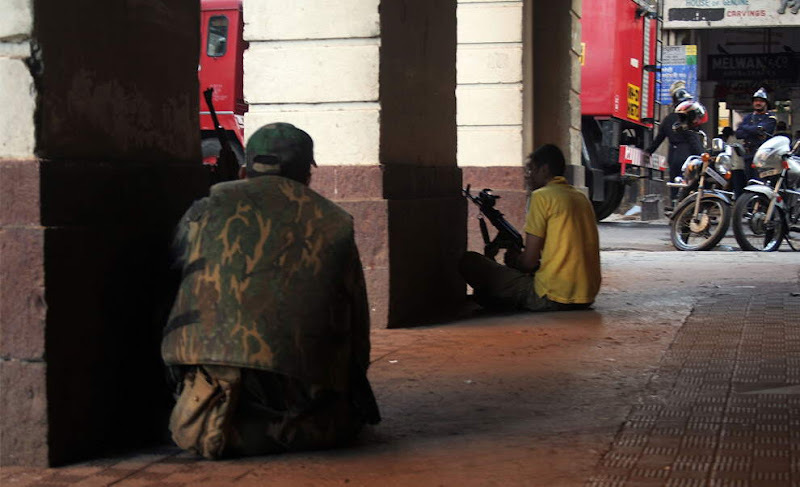 Indian commandos freed hostages from Mumbai's Taj Mahal hotel on Thursday but battled on with gun-toting Islamist militants. An Indian commando runs into Taj Hotel prior to a gun battle in Mumbai November 28, 2008. 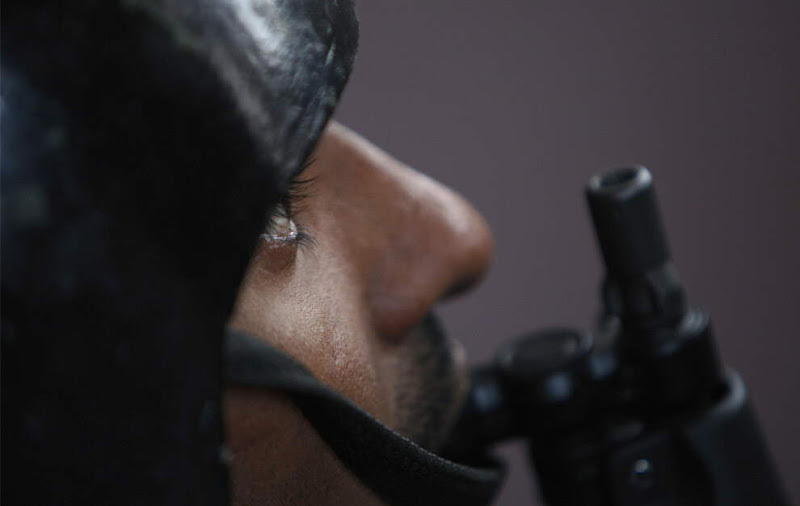 A chief of an Indian commando unit flushing out militants at the hotel said on Friday that he saw 12 to 15 bodies in one room. 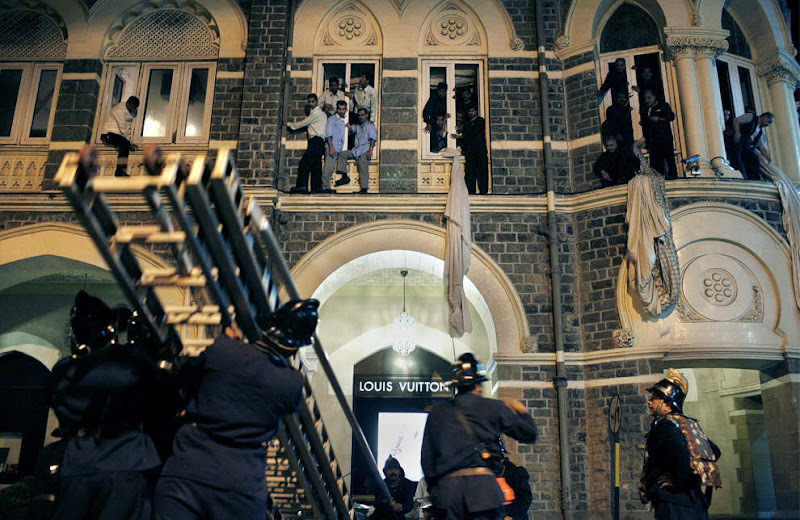 Italian chef Emanuele Lattanzi carrying his daughter walks out after being rescued from Oberoi Trident Hotel where suspected militants are holed up in Mumbai, India, Friday, Nov. 28, 2008. 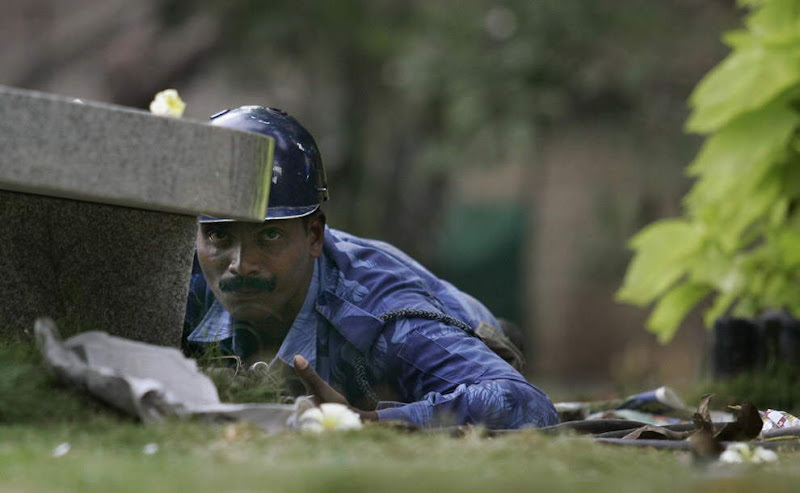 An Indian paramilitary soldier lies on ground as he looks toward the Taj Mahal Hotel where suspected militants are holed up during an assault in Mumbai, India, Friday, Nov. 28, 2008. 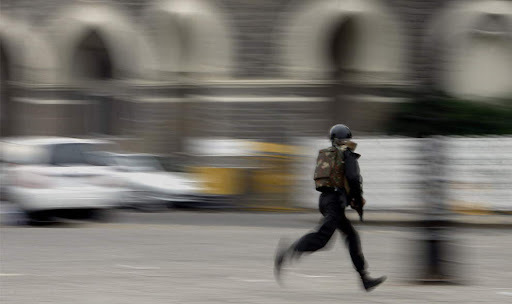 A member of the anti-terrorist squad takes a position during an engagement with suspected militants at the Taj Mahal Hotel in Mumbai, India, Friday, Nov. 28, 2008. People read a newspaper carrying reports of the shootings in Mumbai, in the northeastern Indian city of Siliguri November 28, 2008. 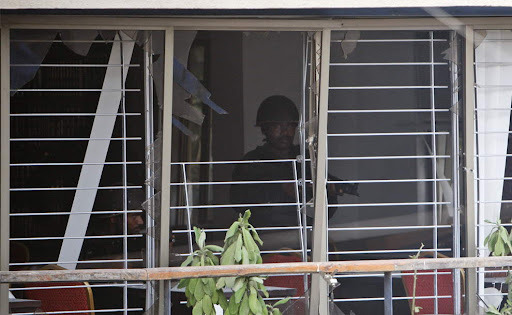 Indian commandos took control of Mumbai's Trident-Oberoi hotel on Friday, but battles raged on with militants who were still holed up in another luxury hotel and a Jewish centre with about half a dozen foreign hostages. 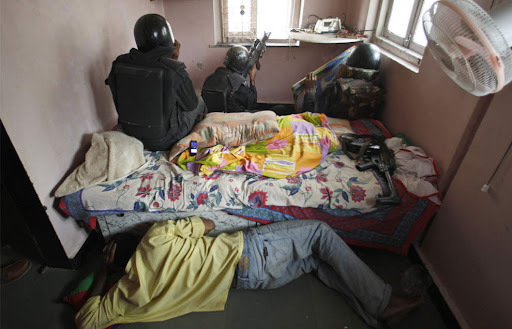 A National Security Guard commando rests during a lull in action after firing at suspected militants holed up at Nariman House in Colaba, Mumbai, India, Friday, Nov. 28, 2008. Commandos ended a siege of the luxury Oberoi Trident Hotel on Friday while other forces rappelled from helicopters to storm a besieged Jewish center, two days after a chain of militant attacks across India's financial center left people dead and the city in panic. A National Security Guard commando fires at suspected militants believed to be hiding in Nariman House, in Mumbai November 28, 2008. A National Security Guard commando is seen after securing a floor during an operation against terrorists holed up at Nariman House, the headquarters of the ultra-orthodox Jewish outreach group Chabad Lubavitch, in Colaba in Mumbai, India, Friday, Nov. 28, 2008. A resident takes cover for possible return fire as National Security Guard commandoes fire at suspected militants holed up at Nariman House in Colaba, Mumbai, India, Friday, Nov. 28, 2008. 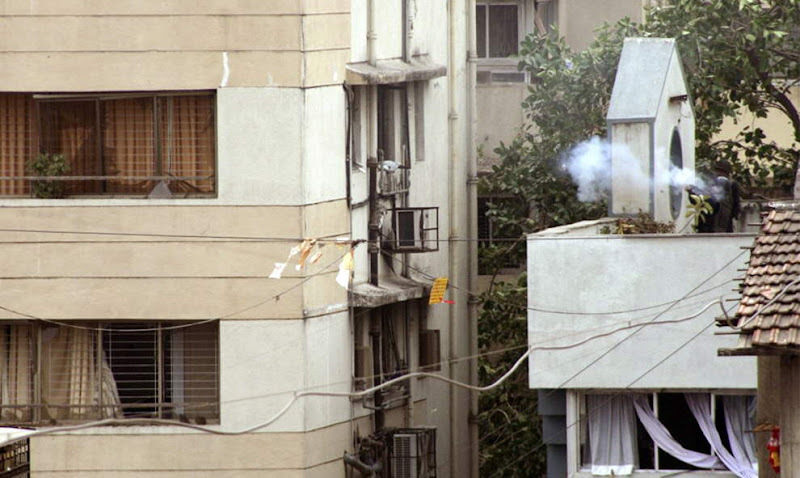 Indian commandos are airdropped in Nariman House, where the armed militants are believed to be holed up in Mumbai November 28, 2008. 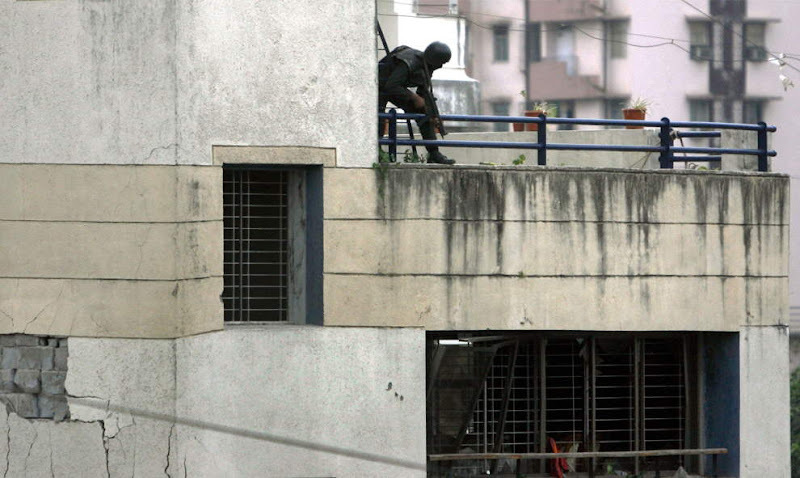 A National Security Guard (NSG) commando aims towards a window after an explosion on the fourth floor of the Nariman House where suspected militants are hiding, in Mumbai November 28, 2008. 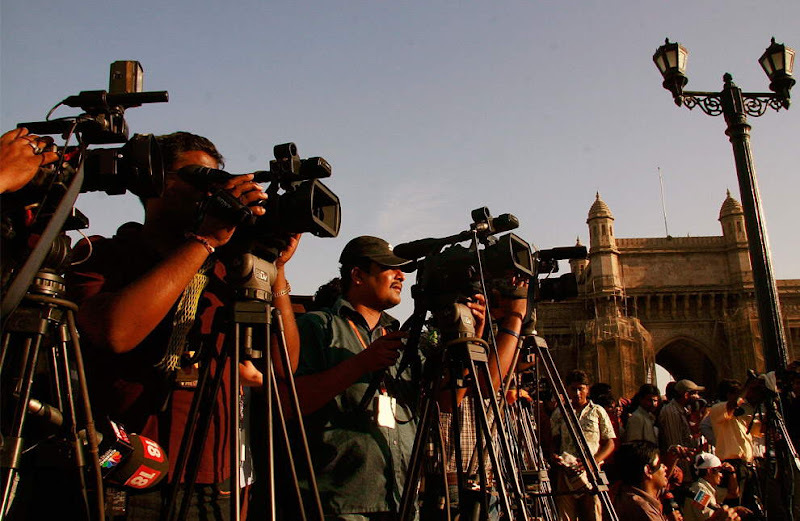 The media focus their attention on the beseiged Taj Mahal Palace Hotel on November 27, 2008 in Mumbai, India. 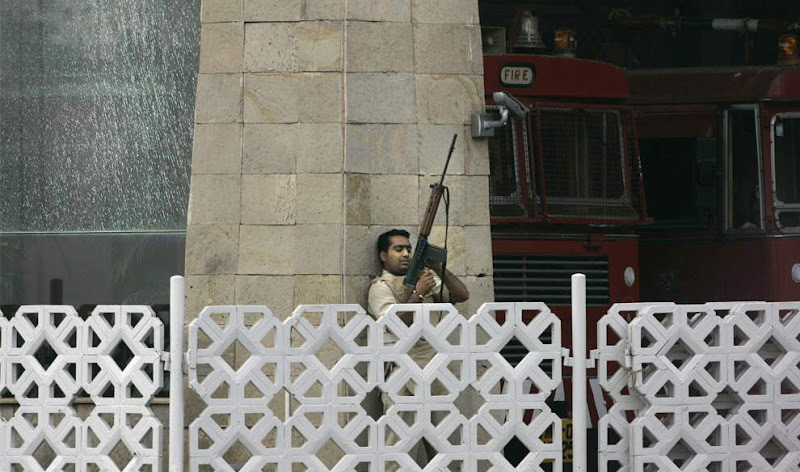 Armed personnel hold handguns as they secure the area outside the Taj Palace hotel in Mumbai, India, Thursday, Nov. 27, 2008. 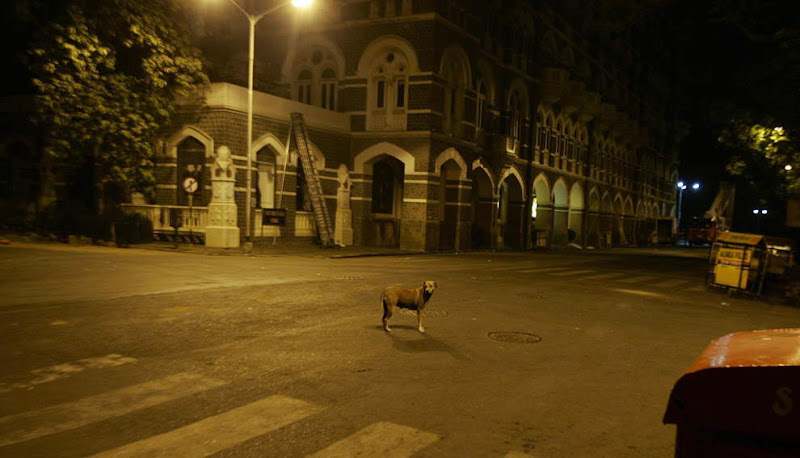 A stray dog stands on a deserted street outside the Taj Mahal hotel where suspected gunmen are holed up in Mumbai, India, Friday, Nov. 28, 2008. 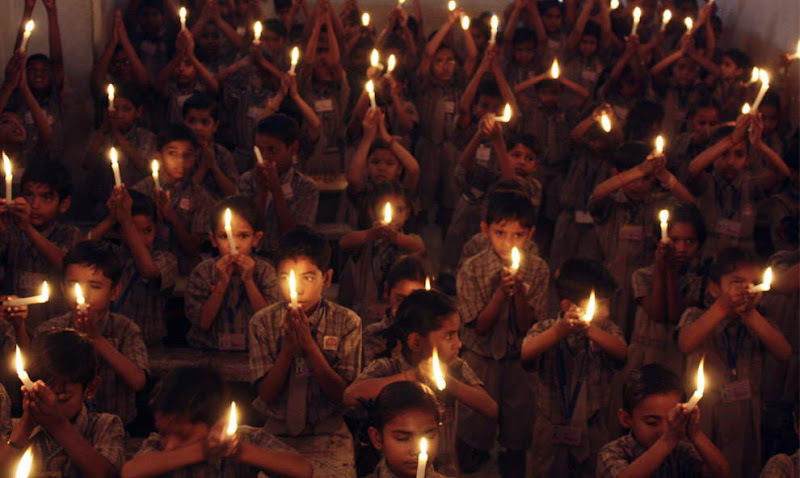 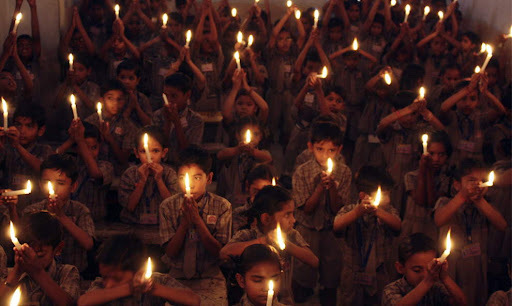 Schoolchildren hold candles during a vigil held in memory of the victims of Wednesday's shootings in Mumbai, in the western Indian city of Ahmedabad November 27, 2008. 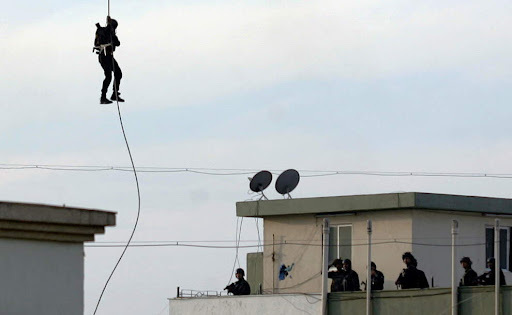 Elite Indian commandos fought room to room battles with Islamist militants inside two luxury hotels to save scores of people trapped or taken hostage, as the country's prime minister blamed neighbouring countries. 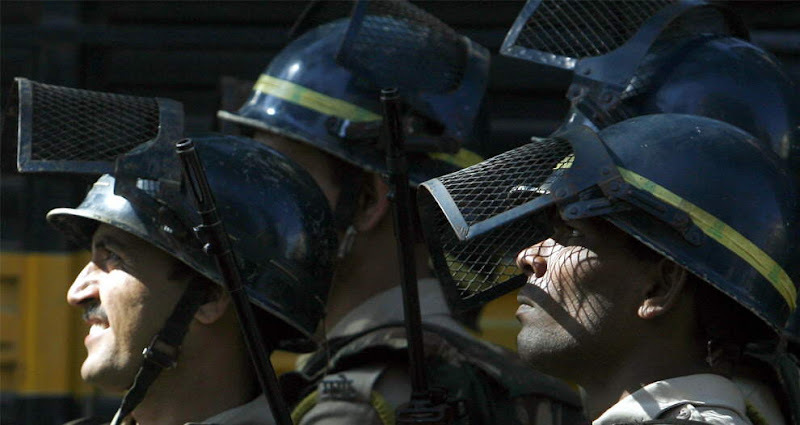 The military take up positions outside the Taj Mahal Palace Hotel on November 27, 2008 in Mumbai, India. 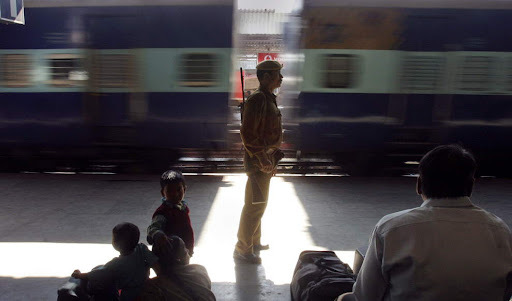 A security officer stands guard at a platform in Gauhati railway station in Gauhati, India, Thursday, Nov. 27, 2008. 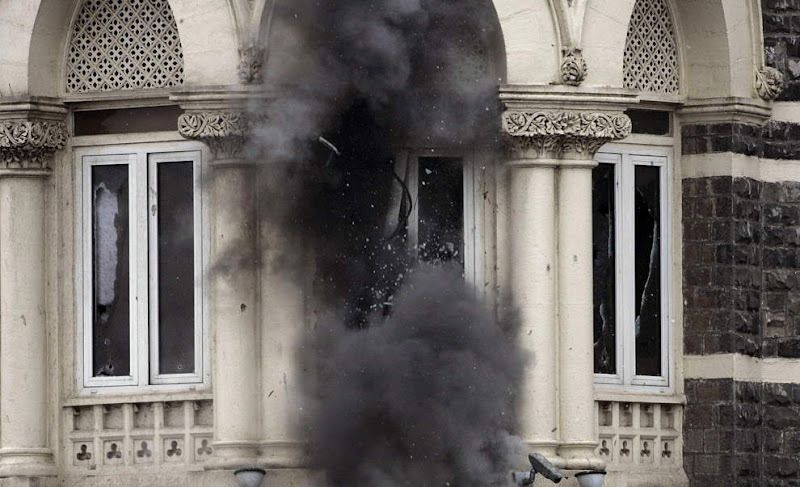 The windows on the first floor of the Taj Mahal hotel shatter after the use of a grenade launcher in Mumbai, India, Friday, Nov. 28, 2008. Explosions and gunfire continued intermittently at the Taj Mahal hotel Friday afternoon, two days after a chain of militant attacks across India's financial center left people dead and the city in panic. Policemen take position outside "Nariman Bhavan", where armed militants are believed to be holed up in Mumbai November 27, 2008. Sharda Janardhan Chitikar, left, is consoled by a relative as she grieves the death of her two children in a terrorist attack while she waits for their bodies outside St.. Georges Hospital in Mumbai, India, Thursday, Nov. 27, 2008. 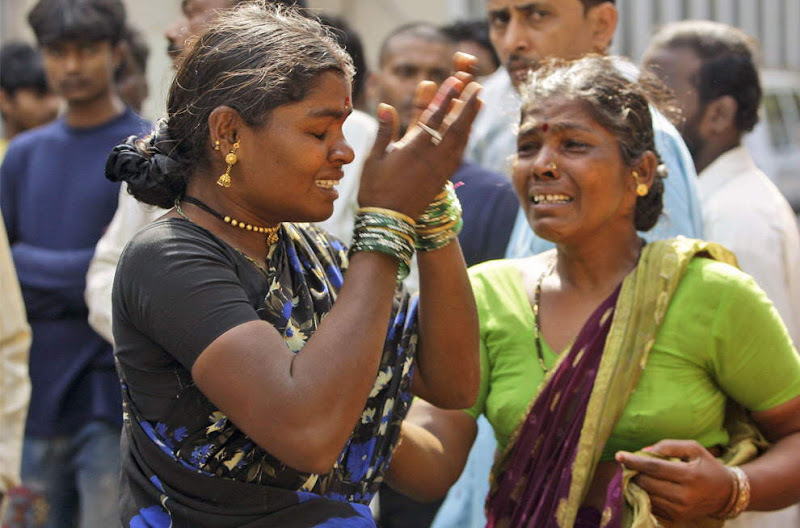 A woman (right), recently evacuated from Mumbai following the attacks, hugs her mother upon her arrival on November 28, 2008 at the military airport of Torrejon, near Madrid. Sixty Spanish citizens who were in Mumbai when the attacks erupted in the Indian city were expected back in Madrid Friday on a Spanish air force plane.